We missed the Oscar cut this week, and I think we know why. I feel like we have room for growth in our instructional video skills. 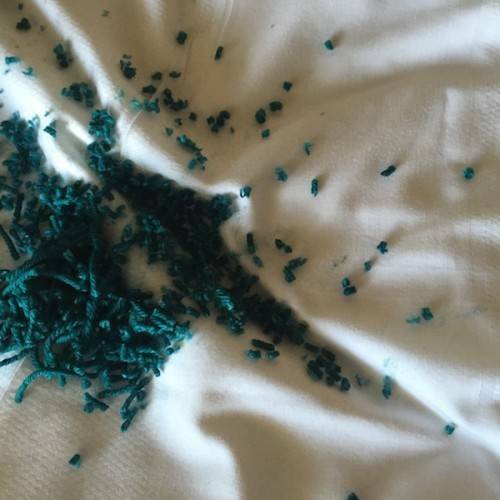 Take a look, for example, at what happened in that hotel room in San Diego last week, when it seemed like a good idea to do a little how-to movie about making a pom pom. There is a certain amount of quiet, subtle drama here, but really, we left out a lot of things. Kind of basic: We don’t explain that we are demonstrating the proper use of the Clover Large Pom Pom Maker, 3 1/2″ model. Here is one half of the Clover Large Pom Pom Maker. No, this is not a 1990s-era birth control pill box. This is your ticket to the awesome fluffy pom pom of your dreams. People may try to talk you into using a fork, a tube of cardboard, a willing house pet’s foreleg, but trust us, this is a single-use appliance that earns it keep, every time. 1) Remember the goal in pom pom making: to be rich, velvety, and dense. Like wall-to-wall carpet in spherical form. 2) To achieve denseness, you have to overload your Clover Pom Pom Maker with yarn. Go until you can’t really get more yarn onto the thing. Way beyond the Recommended Daily Allowance. Overinflate the tires. Anything less, and you’ll end up with a spindly, floppy pom pom. 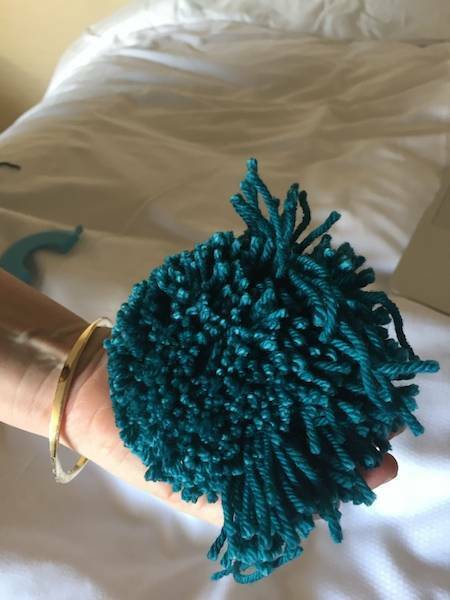 3) Achieve velvetyness by trimming away more of the pom pom than feels necessary. I would like to say that these are outtakes from our pompom instructional video, but the fact is that they are the only takes. We’ll be back at some point with a really on-point pom pom video. Until then, all you really need to know is 1) overload and 2) overtrim. And avoid leaving behind a trail of flurf. Just used the Clover for the first time this week. (I had been using another brand.) agree that it’s pretty awesome. Until little toddler fingers started picking the pompon apart, yarn piece by yarn piece. Looks like I might be getting extra practice. I love the Clover Pom-pom makers! I have all the sizes and look for opportunities to make pom-poms. Big pom-poms. Little pom-poms. I offer to make them for friends. I choose patterns for the pom-poms. I see plain old hats that could benefit from a flourish. So much fun. I find fascinating the revolving videos that you have presented here. It seems as if they are growing exponentially. It’s gotten out of hand for me (no pun intended) because I do not finish looking at 4, when 4 different ones pop up! Some how I got from pom poms to finger knitting, which is fascinating. I had read of it years ago as it being the beginning of knitting, but always wished to know more about it. Not techy enough to think in these more modern days of finding a video on the subject, I thank you guys for doing it. Kudos Kay and Ann! Perfect timing. My Baa-ble hat is on the needles and I was wondering how to achieve a great pom-pom. Thank you! Why do I not own one of these. I usually use two cardboard C’s, that I make each time I need one. The key to any good pom-pom is way more yarn than you think is good for it. I recently used the fork technique with success. Generally, I avoid making them like the plague. Nobody in my house wants to wear them, ever. Pom Pom Greatness! The Clover PomPom Maker looks more upscale than the ones I used as a kid. I Want One (I wonder if I can it here in Ontario). And they come in different sizes? I’m off to google them. Carry On. 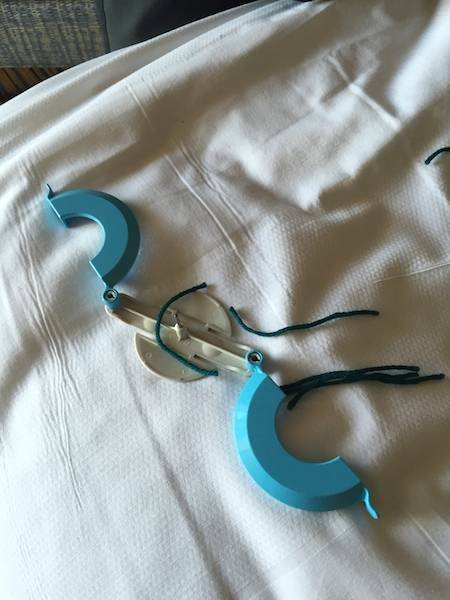 I have 4 sizes of this Pom Pom maker. I also have 2 granddaughters who LOVE making Pom Poms. They have 2 kittens who love playing with Pom Poms – imagine the trail of fluff! I have one of these but haven’t tried it yet. I’ve always been so unhappy with the droopy pompoms produced by cardboard winding. I also have done the long twirled cord with much happier results. Looks great with different colors. You deserve a gold statuette! I will make better pompoms by overloading that sucker! And have you seen Lene Alve’s mittens with small pompoms? Like all things Lene, they are something fabulous that I’d never thought of. Gotta get a small maker. I can’t comment on the Pom-Pom technique, but you two definitely could use a little guidance on your red carpet techniques. I must be the only person in the knitting universe who hates pom-poms. Does that make me a bad person? I didn’t understand the Orson Welles hashtag, either. We’re kindred souls. I loved your videos! And the word you were looking for was “surgeon’s knot”. I use them all the time. While these videos poignantly mirror my own struggled with the Clover Pom Pom maker, they are curiously followed by suggestions from my browser to watch video clips from Three Stooges episodes. I feel like there is a message from beyond for me here. Cinéma verité! You are having too much fun. I don’t usually pompom, but that looks temptingly velvety when you trim it down. Only one hint on your film-making skills: Go horizontal and fill that frame! I suppose this day had to come. After years of learning innumerable things knitter my and otherwise from M-D, and always being impressed by your down-to-earth simple is better approach, I have a small disagreement: I like making pompous with cardboard. Why buy yet another piece of knitting paraphernalia (which I inevitable misplace and so end up with more than one), when the cardboard not only works great but allows for infinite sizes of pompoms, while the plastic gadget comes in various sizes. True, I’ve not made a ton of pompoms but the few I’ve do shave been fine. Altho now that I know from you, about overfunding and extra clipping I’m guessing they’ll be better. Albeit still from cardboard. I just used my Clover Pom Pom maker last week for my Baa-ble hats. I’ve not made many before that because of the struggle. This tool is excellent. I used YouTube videos to learn how to use it. So videos are great! On a related movie-knitting note, “Brooklyn” features a few lovely sweaters. The best part was “what happened?” when you tried to release the pom-pom. That would totally be me. But thanks to your Oscar worthy video I now know how to avoid that. I’m about to make a hat that requires a pom-pom and had been debating going old school with the cardboard or investing in a pom-pom maker. You’ve convinced me to go high tech. I’ve never found my other pom-poms to be very good. Laura, I have to agree that the sweaters in Brooklyn were quite lovely.